Surviving a spider bite as a yearling, the aptly named Australian warmblood mare A Spider Bite recently competed in her very first international Prix St Georges class at the 2014 CDI Orange in Australia on 14 - 16 February 2014). Breeder, rider and co-owner Sally Evans describes her as a a little fighter. “She was bitten very early on and the vet even thought it may have been a white tail spider,” Sally Evans explained. “They are a horrid spider and the bite can cause lots of ongoing pain and suffering, sometimes for years. Luckily for us, after the vet treated her, she healed and there is not even a mark where that nasty spider bit her." Bred by Sally and her husband, A Spider Bite is by their stallion A'Seduction, a horse that Sally trained and competed right through to Grand Prix, out of the Grand Prix mare Atalanta. 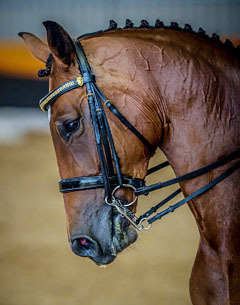 With a 61.81% in her first Prix St Georges, Sally told Eurodressage that her first big test with “A Spider bite” was a bit daunting to say the least and believes that she was a bit nervous of putting the horse under this pressure. “However, our finishing in the top 6 in the Advanced and 5th in the freestyle was a big thrill for us, and Sue Macdonald, her co-owner, and I were so pleased with her," she said. Evans has set Grand Prix as goal for A Spider Bite, who is known as CC in the stable. The mare got her nick-name after the two people that gave the couple the opportunity to use their Grand Prix mare, Atalanta. "Their names were Chris and Carolyn. Actually, this all started when I worked in the racing industry, for a trainer, he would buy a horse and give it a name of the people he bought it from," she said. Now earning her eighth championship rug, Sally feels that the bay mare is truly a champion in their eyes giving both owners a lot of joy! “Sue Macdonald has had it pretty hard lately in life. With breast cancer in her thirties, once back riding a freak accident left her with a broken back, crushed vertebrae," Evans explained. "Then Cancer again, losing a kidney, chemo, then more cancer with lung cancer and even more chemo, but Sue is all over it, winning not only with this, but with our beautiful mare as well."